I next examined relationships that might exist between any two structures. Unfortunately, we do not have data on the Bent and Flat pyramids. We do not know how their base dimensions might affect our study, or be related to other pyramids. One can immediately recognize two possible patterns. Meydum and the Giza 1 Core are opposite to one another in the arrangement of the side length difference from their respective means. The Bent Wall and Giza 2 are reversed in the sequence of their arrangement. The Giza 1 Case might be related to the Flat or the Bent but those data are missing. Closer examination of Meydum and the Giza 1 Core reveals an important relationship. Not only are the deviations of the Giza 1 Core sides from the mean always opposite to Meydum in sign — they are also always approximately one-tenth the value. The values from Table II are shown here. This relationship is expressed by the simple equation: (Meydum = - 10 Giza 1 Core). Figure Seven A shows the relationship; Figure Seven B the correlation. This unusual relationship is, once again, obviously due to design intent; it cannot be due to accident or mere randomness in construction control. It demonstrates a direct tie between the first structure in the group and the last, and lends powerful additional support to the proposal that the IVth dynasty structures were all planned as one vast project. 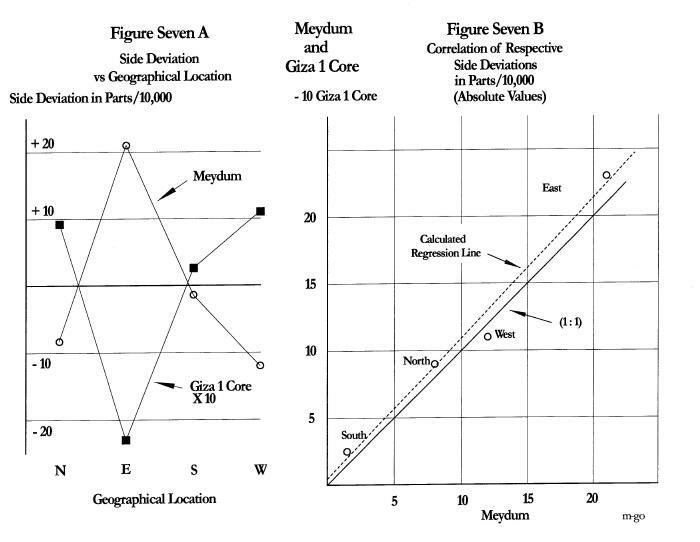 If the builders of Meydum had uncontrolled random variation in side lengths then the builders of Giza 1 knew the values and imitated them in the Giza 1 Core, but made them all 0.1 of Meydum and inverted the difference from the mean on all four sides. At this point we can see how absurd such proposal would be. Another objection to this display is the fact that the Giza 1 Core might have remained buried beneath the outer casing and never discovered. But such lack of discovery would not seriously detract from this study. Giza 1 Core is at the same position as Giza 2 on Figure Three, and does not affect the derivation of the equation for the Orientations with respect to pyramid number. Then, on Figure Four, we would detect a missing data point, as we found for the Unknown structure after Meydum. We should then be stirred to discover the location of that structure. Thus it is entirely possible the designer/builder anticipated our analysis, and worked on the assumption that we would be curious enough to make that discovery. The use of a 10:1 multiplier shows great ingenuity. Since the two pyramids differ greatly in base lengths they could not be related directly by physical dimensions. The ratio of 10 once again expresses a number that is more easily recognized by someone attempting to understand the design, rather than, for example, 7 or 9. We have now mathematically refuted all suggestions that the constructions and consequent data are due to random chance or mere coincidence. 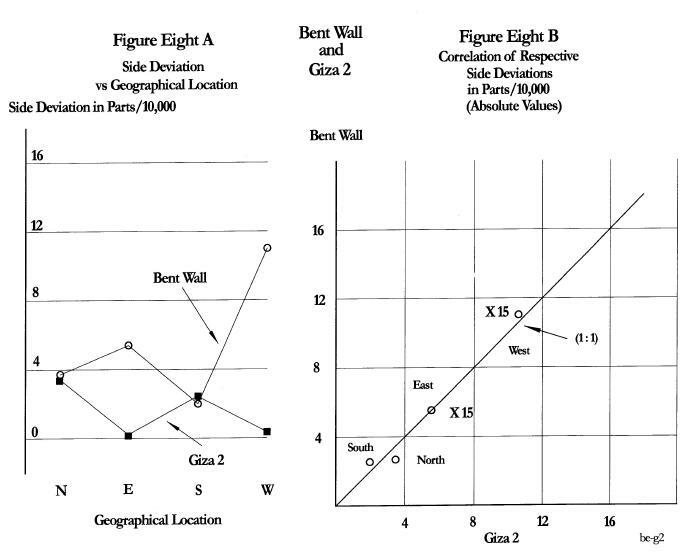 I next examined the relationship between the Bent Wall and Giza 2. Here the data are not so simple. Several relationships can be noted. The North and South sides are nearly the same in absolute value of the deviation from the mean for both structures. A multiplier of 15 holds for the East and West sides of Giza 2 to make them nearly equal to the Bent Wall. A simple reversal of sign does not hold: The East side of Giza 2 is opposite, but the West side is not. However, if we plot the values on a graph we see that the changes, not the signs, are opposite for both the East and West sides. This peculiar arrangement then leads to the (+) and (-) sequence shown in the earlier table. Again a multiplier of 15 is more “neat” than 13 or 17. Note that the South and North sides on Figures Seven and Eight hold the same relative positions but that the East and West sides are reversed.